Have you seen the fabulous food blog Evil Shenanigans? No? Well, let me tell you why I love it. First, it has the word shenanigans in it, which I think we can all agree is one of the best words there is. It’s just fun to say. Shenanigans! Ahem. Anyway, I also love it because of the excellent recipes and mouthwatering photography. Evil Shenanigans is written by Kelly, who is a part-time culinary student and the sole reason my pants don’t fit. As I was browsing Evil Shenanigans last week, I saw Kelly’s post about Chocolate Loaf Cake. 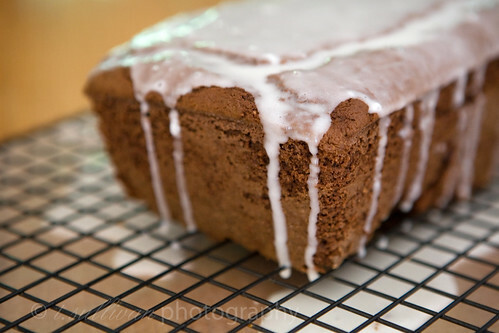 We all know how much I love chocolate, but did you know I also love loaf cakes? They’re quick, easy, and small, and they usually don’t come packaged with the guilt that is buttercream frosting. What’s not to love? 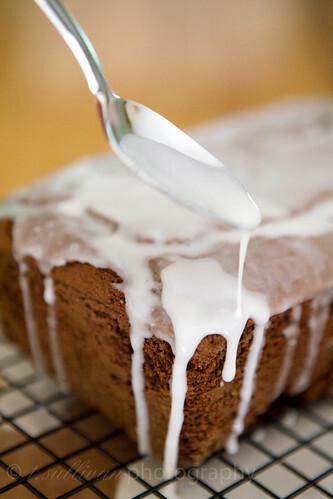 Making this chocolate loaf cake was a good exercise in reading comprehension for me. Like, when a recipe says “grease and flour a 9×5-inch loaf pan”, it’s best to do that and not, say, grease and flour your 8×4 inch loaf pan. And if you do that anyway, it’s probably best to realize your mistake before you fill it with batter and stick it in the oven. Also, if the recipe says to use a knife to release the cake from the plan, don’t skip that step unless you want a broken cake. Fortunately, despite my idiocy, the cake didn’t overflow the pan and I was able to mostly put the broken pieces back together. Lesson learned! As for the flavor, I wanted to love this cake. I really did. I had visions of it tasting like a glazed chocolate cake donut. You see, I’ve been a little bit obsessed with donuts lately. But this cake didn’t live up to my expectations. Not the recipe’s fault, though! Because I live out in the sticks and had to use semi-sweet Baker’s chocolate instead of the dark, good stuff, the cake came out tasting a little bit sweeter than I would have preferred. The moist and tender crumb and the delicate texture of the cake still made it worth eating, though. In fact, I found the perfect accompaniment. 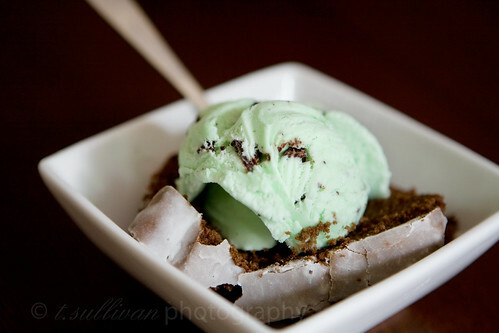 The creaminess of the ice cream and the bright, cool mint were just the right balancing flavors for this cake. And now I can’t wait to make it again! But next time I promise to do it right. First, I have to say that I recommend the original recipe over this one. I’m pretty sure it’s better. That being said, if you’re like me and can’t get your hands on some good quality dark (64% cocoa or higher) chocolate, this recipe yields good results with the Baker’s semi-sweet (54%) chocolate found in most grocery stores. The original recipe also calls for a white chocolate glaze. Since I’m not a fan of white “chocolate”, I made mine a powdered sugar glaze instead – just like donuts. Whisk flour, cocoa powder, baking powder, baking soda and salt together in a medium bowl until well combined. In a stand mixer or large bowl, cream butter and sugar until light in color. Add the applesauce and mix well. Add the egg and egg white one at a time, thoroughly incorporating each. Add the cooled melted chocolate and vanilla. Beat until combined. On low speed, add the flour mixture, alternating with the sour cream, starting and ending with the flour mixture. Mix until just combined. Pour the batter into the loaf pan and even out the top with a spatula. Bake at 350°F for 55-60 minutes (longer for an 8×4-inch pan), or until a toothpick inserted into the center comes out clean. Allow the cake to cool in the pan for at least 10 minutes. Run a thin knife along the sides of the pan to help release the cake. Turn out onto a wire rack and allow it to cool completely. To make the glaze, measure the powdered sugar into a small bowl. Add the cream or half & half one tablespoon at a time, mixing completely before adding the next tablespoon. Stop when the glaze reaches a pourable consistency. Place the cooled cake on a rack set over wax paper. Pour the glaze over the cooled cake and let it set until the glaze hardens. I know I found it on your site, but now I can’t find the post about Monkey bread… I used your friend’s recipe… hmm hmm good! Thanks! I’m not a fan of white chocolate either. I’m loving this glazed chocolate! It’s slightly lighter in texture than a flourless chocolate cake (it only has 1/4 c. flour). Whether it puffs up and falls like a “normal” soufflé or not, it’s still darn good. I served it with some fresh whipping cream (which you could also add a tsp. of instant coffee to while mixing for an “espresso whipped cream”). The cake is not too sweet, not too cakey, not too fudgey. Can you tell I HIGHLY recommend this cake? Now….off to buy more chocolate chips!